Doors Of Growth Counseling is committed to its clients and providing them with exceptional service. I strive to help my clients become the best version of who they want to be. I believe Knowledge is power and I operate from the perspective that by providing my clients with new skills, tools & insights, they will be able to heal themselves. My hope is that through counseling, my clients will be able to change the lens through which they are viewing life, others and most importantly themselves. It is also my hope that through healing their lens, they will positively change the way they relate to their internal and external world. When a person can change the way they relate to their environment, it forces the environment in which they exist, to change the way it relates to them. For those seeking addiction counseling, my Addiction Treatment Philosophy is Recovery Inclusive. I am not a proponent of the disease model of addiction, although I do support it. I strive to meet all my clients where THEY are at, and will support them in whatever recovery model they are most comfortable with. I have found the All or Nothing/Extreme approach to be counter-productive at times. I work to help my clients define what recovery means to them, after all, sober by definition is, in moderation, to not be drunk! I support all modes of recovery, including but not limited to...Suboxone, Methadone, Vivitrol*. *Doors Of Growth can offer referrals for such services and receives no incentive to do so. Ms. Ogilvie/Doors Of Growth is not a medical prescriber or doctor. *EXTREMELY IMPORTANT: must be free from all opiates for 7-10 days and have completed the Naltrexone Challenge before Vivitrol can be responsibly and safely administered. I believe in treatment that meets my clients where they are at, while offering them a challenging and supportive environment in which to heal, grow and change. Having an addiction, personality disordered trait, distorted thought or fixed belief is like seeing a chair in front of you that is painted red. You know it is painted red, however, your therapist sits beside you and insists the chair is green. Your life, health and relationships depend on you realizing it is green, but you never see it. Eventually you may learn to trust your therapist, the chair must be green right? You pay your therapist to bring these things to your attention and to not lie to you: Your therapist wouldn’t lie to you…right? But still no matter how long you stare at the chair, the chair is still clearly red. So your survival depends on trusting your therapist’s judgment above your own on these particular matters, and that is hard, hard as hell. Once you can trust your therapist and do the work, you realize the chair actually was green all along and your brain was just protecting you. It’s called Cognitive Dissonance and ends many a therapeutic relationship. Cognitive Dissonance will keep you in denial….the familiar, the pain, the life you have been living: Only trust, pain or tragedy, or all three, will bring you out. The choice is yours! 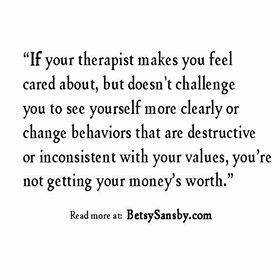 Therapists do not enjoy calling their clients out on their dysfunction, but this is what a good therapist will do. A good therapist will risk and sacrifice not being liked by you, thought of badly by you, their reputation (if you go around bad mouthing them for bringing to light your dysfunction), a bad review, lost income and even possible retaliation to name a few….and all because they are just trying to help you. Remember, if they are bringing to light your dysfunction, they are doing their job and putting your needs above theirs! This is why some therapists don’t bring people’s dysfunction to their attention, because their needs supersede your needs. Please remember, your therapist is a person too and they have worked really really hard to get to where they are! If you can’t trust the professional opinion of someone you are paying to help you, tell them you are having trouble trusting them and why. Take the risk, share your feelings, give them feedback in session and if that doesn’t work, ask them for a referral. Trust me, most therapists are there to help you and truly want to see you get better, so much so that they will help you find another provider that might better suit your needs! Don’t Personalize or Get Hung Up On Delivery. This Is An Extremely Valuable Life Skill. Trust The Therapist Is Coming From A Good, Kind and Caring Place. Trust Me, It Is Not A Personal Attack. Separate Behaviors/Traits From Person/Self. Offer Your Therapist Feedback & Learn How You Are Able To Best Hear Feedback BY Telling Them When Their Feedback Style Works and When It Doesn’t. Don’t Expect Yourself or Your Therapist To Be Perfect. Tell Your Therapist How They Make You Feel and Be Willing To Work On It Together. Remember Most, If Not All Things, Your Therapist Does or Is Doing Has Therapeutic Value. If Your Therapist Utilizes Appropriate Self-Disclosure Know They Are Trusting You. Please Don’t Violate that Trust and Share Their Information With Others. Do Your Homework and Complete Assignments. Read The Book. Practice Your Skills and Tools. One of The Best & Safest Places To Practice New Skills and Tools Is In Session. Be Your Authentic Self. Don’t Filter Yourself. All Your Information is Confidential & In a Small Owner Operated Private Practice The Only Person To See Your Information is Your Therapist. No Secretary, No Administration, No Billing Personnel….Just Your Therapist! Practice With Your Therapist How You Would Like Others To Treat You. If They Make a Mistake, Bring It To Their Attention and Be Willing To Work Through It. If You Need Something To Be Different Tell Them. Trust, Trust, Trust Your Therapist, and If You Can’t, Tell Them What It is That Is Making It Difficult (Past Relationships) or What They Are Specifically Doing That Is Making It Difficult. Don’t Be Vindictive or Retaliatory! This Only Speaks To The State Of Your Mental Health. Your Therapist Deserves A Safe Space In Which To Feel Confident Helping You. Don’t Make Your Therapist Your Invisible Army…”Oh Yea, Well My Therapist Said….., especially When They Haven’t Said What You Are Telling Others They Said. BE HONEST- Your Therapist Can't Help You If You Are Not Honest. Please Don't Portray An Image Of Who You Want Them To Believe You Are. Don't Pay A Therapist To Listen To Your Lies. Might as Well Take Someone Out To Dinner and Tell Them. At Least This Way You Both Get A Meal. One Of The Goals Of Therapy Is RADICAL HONESTY by both you and the therapist! Follow and Know Practice Policies.